If your cat was peeing on your bed, I'm the guy who would come to your house and help him stop. I'm what you would call a cat behaviorist or a cat expert, and yes, I do this for a living. I didn't choose this path or grow up thinking, "I want to be a cat behaviorist." It chose me. 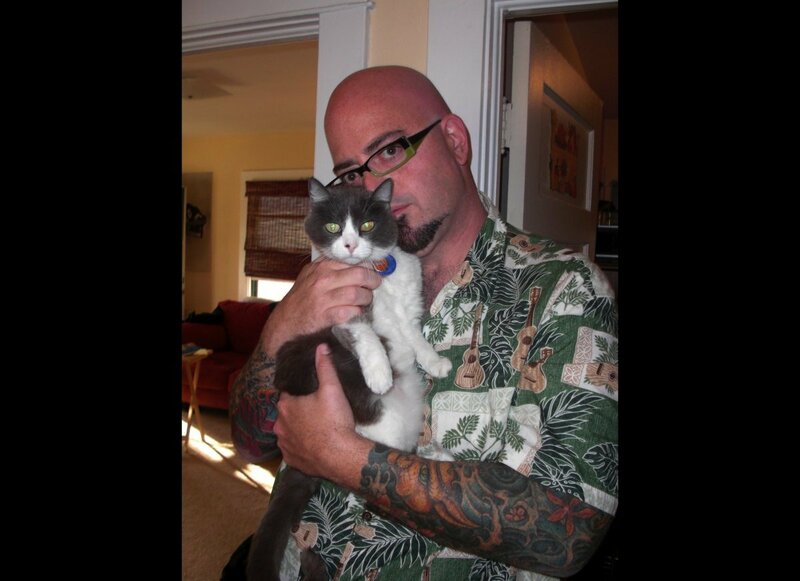 On my show, My Cat from Hell, I help people find ways to strengthen their relationships with their cats, and many of the methods I use and teach are ones that I developed while working in the trenches at an animal shelter. Since I began working with cats, I've met tens of thousands of felines, in shelters and in homes. But the one cat who taught me the most was Benny. Benny was what I like to call the original cat from hell--seven pounds of feline frustration who I loved with all my heart. My book, CAT DADDY: What the World's Most Incorrigible Cat Taught Me About Life, Love and Coming Clean, centers on my relationship with Benny--the one who taught me the most. I don't play favorites. My house was always full of critters, but Benny demanded more than the others in every way. He was challenged physically and challenging behaviorally. He put me through my CAT DADDY paces for almost fourteen years and kept me humble. At the same time, Benny was witness to and participant in the most chaotic period of my life. Without him and without the critical lessons he and many of the other special animals in my life have taught me over the years, I may not have survived--and I certainly wouldn't have made it as far as I have. On my best day, I don't have the patience to cook pasta without throwing it across the room. That particular character flaw serves me not one bit when it comes to observing, diagnosing and working with troubled cats. I was consulting on a case the other day where the guardian was so frustrated with what his cat was doing that he actually hit the cat as I stood watching. Then he shot me a shamed look as if to say, "I'm sorry - I had no choice!" Without the patience Benny had instilled in me, I likely would have followed that energetically charged lead and yelled at my client. Instead, Benny was in my head saying: "You think this is bad? You haven't completely forgotten our 13 years together, have you?" That's the level of patience he taught me. On every consult that I do, the first lesson I teach is detachment. You've dealt with your cat's issues for so long and are so enmeshed in the situation. Unknowingly, you've heaped emotionality on top of your own home-brewed diagnoses and created nothing but resentments. The best thing I can do is help detach you from the poisonous way of looking at things--so that you don't react out of frustration. I give initial rounds of homework based on sharpening your cat mojo - training you to be a better cat detective. Rewind the tape when you observe a negative behavior; When was the last time you fed your cat? When was the last time you played with your cat? What's going on outside your house? These are fundamental questions to ask when you're trying to solve these issues. If it feels personal, then you're exactly where you shouldn't be, and that's something that Benny taught me. When the being you share your life with presents you with mind-bending challenges, you adapt. You can't have one strong emotion without the other being just around the corner. I had to ground myself in that thought often, especially when dealing with Benny on a particularly difficult day. I'd think, why were you brought to me? Why are we still together? What is the lesson? Is there more harm than good in this equation? But there was a moment every day where we would just be together and all those thoughts of "why can't you just be a normal cat?" just fell away, replaced by the peaceful and the unconditional that ultimately defined our life together. As humans, we so badly want everyone to fall into a category. You want to be able to read them by their cover and put them into boxes. But you can't. One behavior, one action means nothing in the context of a lifetime. Cats, I think have a much easier time of accepting "bad behavior" by another, and moving forward. Take, for instance, the person who strikes his cat as I'm taking him through an exercise - how badly do you want to say he's a bad person? But he's not. The next moment, you see him interacting with and loving on his cat, and we are all presented with a teachable moment because I didn't close the door on him. Benny taught me about releasing judgment long enough to achieve that elusive breakthrough. Watching a cat like Benny who struggled to breathe or to even walk comfortably for much of his life find joy in the warmth of a bed or the pleasure of a strange little toy reminds you that you have to find a little joy every day. Benny was in a lot of discomfort, both physically and psychologically. But cats are kings of the moment to moment. They're not thinking about what they have to deal with tomorrow, bills to pay, arguments they just had or hatchets that need burying tomorrow. They're thinking about the toy lodged under the fridge, or the treat rattling around in your closed hands. Their daily challenges reside squarely in the present. Benny taught me how to ask myself "Is this worth fighting about or is this just me wanting to fight?" In the wild, cats always have to make the fight or flight decision. And to be sure, not one of those decisions are ego-based or frivolous. In the cat world, drama for drama's sake has no place at the table, that's for sure. Even though Benny did pick fights, he only picked them when he thought it was necessary. Just recently, through meditation and through watching Benny (as well as other cats), I've learned the concept that you win battles by not picking them - by not making yourself sick over conflict or the stress of your day. There are things that you need to fight for, but many of the things that you think you need to fight for, you don't. Animals teach me on a daily basis what I still need to strive for as a human when it comes to being able to love and be loved by other humans. All that matters to animals is the completion of their world that happens in the company of you and the others that define their territory. It's a pure moment to moment thing like no other. Words don't get in the way and past actions don't get in the way. There's a level of stillness in love that humans don't share even remotely often enough. Maybe that's why we look to animals so much in our lives. However, it's a lesson that we two-legged beings need to learn.